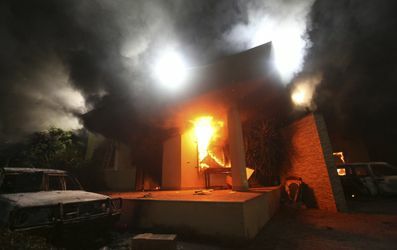 The State Department’s Office of Inspector General is investigating the special internal panel that probed the Benghazi terror attack for the State Department, Fox News has confirmed.The IG’s office is said by well-placed sources to be seeking to determine whether the Accountability Review Board, or ARB — led by former U.N. Ambassador Thomas Pickering and former Chairman of the Joint Chiefs of Staff Adm. Mike Mullen — failed to interview key witnesses who had asked to provide their accounts of the Benghazi attacks to the panel.The IG’s office notified the department of the “special review” on March 28, according to Doug Welty, the congressional and public affairs officer of the IG’s office. This disclosure marks a significant turn in the ongoing Benghazi case, as it calls into question the reliability of the blue-ribbon panel that then-Secretary of State Hillary Clinton convened to review the entire matter. Until the report was concluded, she and all other senior Obama administration officials regularly refused to answer questions about what happened in Benghazi. But State Department spokesman Patrick Ventrell disputed the characterization of the review, saying it is “simply false” to assert the panel is being investigated. “Rather, it is conducting a review of the ARB process itself going back two decades, looking at how Boards are convened, their standards, and the implementation of ARB recommendations,” he said. Since the ARB report was issued in December — finding that “systemic failures and leadership and management deficiencies at senior levels” well below Clinton were to blame for the “inadequate” security at Benghazi — Clinton and other top officials have routinely referred questioners to the conclusions of the board report. Now the methodology and final product of the ARB are themselves coming under the scrutiny of the department’s own top auditor. DiGenova and his wife Victoria Toensing, a former Justice Department official who represents another State Department whistle-blower in the Benghazi case, said their respective clients will testify next Wednesday at a hearing of the House Oversight and Government Reform Committee being chaired by Rep. Darrell Issa, R-Calif. Asked to comment for this article, a senior State Department official told Fox News the IG probe is not a “formal investigation” but rather a review process, and one, moreover, that will examine previous ARBs in addition to the one established after Benghazi. The official noted that the department had published a notice early on instructing employees on how they could furnish information to the ARB for Benghazi, and that the panel ultimately interviewed more than 100 witnesses. The original law that established accountability review boards mandates that they act completely independently, the official said, adding that the department in this case neither sought nor enjoyed any influence over the panel’s work.